MA Sen. Elizabeth Warren Quickly Making Her Mark In D.C.
Massachusetts Senator Elizabeth Warren had a prime seat just a few feet away from President Barack Obama during his inauguration today. In 2 days the freshman senator is expected to introduce the Commonwealth’s other Senator at his secretary of state confirmation hearing. John Kerry is expected to sail through his Senate confirmation hearing and vote. That would suddenly make Warren the Bay State’s senior senator after being sworn into office herself just a few weeks ago. 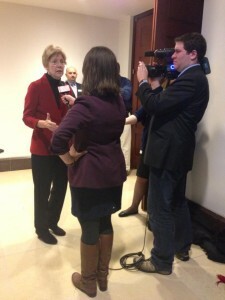 A day after the Inauguration ceremony, Senator Warren told WEBN Boston at the Capitol building that she’s happy to be part of the record setting 98 women in Congress. One issue Warren is determined to change is higher education.